Where are the Muslims who speak out? That is the question always heard after any given jihadist atrocity. The reality is that on the frontlines, inside Muslim majority societies, many intellectuals and activists – if not yet enough - have been risking their lives to denounce fundamentalist violence. But their words are rarely heard in the West. This open letter written by Algerian anthropologist Mahfoud Bennoune inside Algeria in 1995 during the height of the “dark decade” of jihadist violence fearlessly took the terrorists and their apologists to task. Sadly, the text remains all too relevant in today’s world. 1995 Algeria speaks to 2016 Pakistan or Iraq. 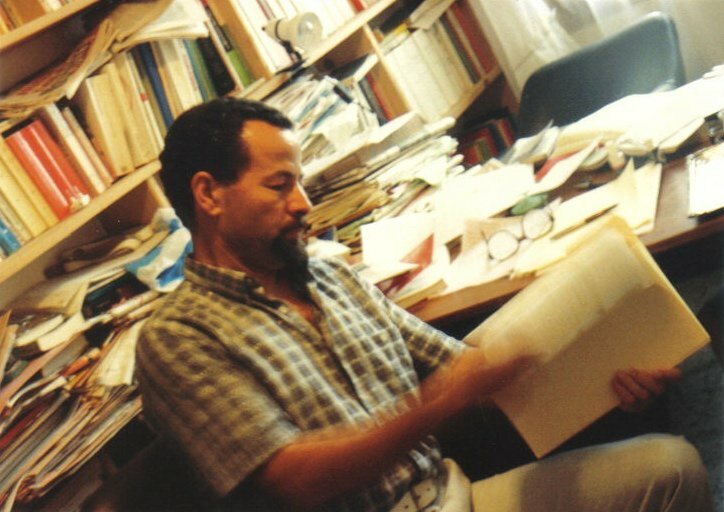 openDemocracy republishes this piece today to mark what would have been Dr. Bennoune’s 80th birthday and as a reminder of all those who resist. Mahfoud Bennoune. Photo: family album. Originally published as Lettre ouverte à M. Anouar Haddam (Porte-parole de l’ex-FIS et des groupes terroristes aux Etats Unis), El Watan (Algiers), Nos. 1483, 1484, September 16 and 17, 1995. Open Letter to Mr. Anouar Haddam (spokesperson of the ex-FIS (Islamic Salvation Front banned 1992) and of the terrorist groups, in the United States). Your answer reveals not only your blindness and stubbornness but also your taking of contradictory positions and your hypocrisy, “nifaq.” … You have tried to insinuate that your organization is not responsible for these savage crimes, and this after you have taken responsibility for innumerable odious and cowardly terrorist acts, such as the assassination of Dr. Boucebci, a professor of psychiatry, and the Amirouche boulevard bombing on the eve of Ramadan which killed more than 40 and wounded more than 250 innocent citizens. All the while, you have been contradicting yourself as you affirmed that your “mujahideen” will continue “armed jihad” until the military dictatorship respects the choice of the people. Tuesday August 29, 1995, I received a call from the region north of Constantine [in Eastern Algeria] where I was a guerrilla fighter [in the anti-colonial struggle] between 1955 and 1962 and therefore knew most of the rural villages and their inhabitants, especially those of my generation. My interlocutor briefed me, with a grief-stricken voice which barely covered his disgust and indignation in the following terms: …The fundamentalist groups’… rejection by the people and defeat by the security forces have transformed them into mutants that are even more brutal… than injured and hunted animals and led them to commit crimes that surpass all understanding. On Thursday August 17 terrorist armed groups burst into Berraq, a village in the district of El Grarem about 30 kilometres northwest of Constantine where they cut the throats of 14 mothers in front of their families. Among them, three were pregnant and one was the mother of a three-day old baby. Filled with horror, a young girl begged the members of this armed group to spare her mother so that she could continue to take care of her brothers and sisters, and to cut her throat in her mother’s place. The Emir or leader of the group kicked her to move her out of the way and cut the throat of her mother himself. Your social, political and military practices and your erroneous… interpretations of Islam have led the partisans of your movement to violate not only the letter but also the spirit of the very Sharia you wish to impose by force on Algerians. The result is that the bands of your fundamentalist network have transformed themselves into heretical sects. In using the Muslim religion to take power by any means and no matter the cost to the people and the country, you have drifted away from Islam. You know very well that no Muslim can claim the right to label another Muslim an apostate and declare an armed jihad to “reIslamize” him or execute him so as to save his soul. No Muslim has the right to condemn the nation state of a Muslim country whose constitution stipulates that Islam is the religion of state. Such condemnation constitutes… the principal cause of the “fitna,” or civil war which has ravaged the country since the massacre of young recruits carrying out their national military service in Guemmar on 25 November 1991, (Translator’s Note: This killing of ten young recruits was reportedly carried out by the Army of Islamic Salvation, a militia close to the Islamic Salvation Front) one month before the legislative Elections of 26 December of the same year. Reasonable people would certainly agree that your fundamentalist network… has a strange way of “making the people’s choice respected,” by exterminating and mutilating the children, women and men, old and young, who make up this very people. One of the monumental political errors committed by your movement was to have recourse to terrorism. Instead of working so as to reassure and protect the population, by sparing its factories, schools, and means of communication, so as to win its moral and political support in your so-called struggle against the corrupt and corrupting system and its men - you have alienated the population. Speaking of the “mafia”,(Translator’s Note: in the Algerian context this term refers to networks of corruption that are alleged to include actors within the state) and of your terrorist hordes, an ordinary woman made the following declaration, with… wisdom and bitterness. “Between the thieves and the killers, there is only one choice I can make to save my own life. I prefer to live under the rule of the thieves.” This is a painful choice and one that I understand only too well! In wanting to, as you claim, uphold the “choice of the Islamic solution,” in unleashing your fundamentalist bands, you have plunged the people into a descent to hell instead of taking them to the earthly paradise that you unceasingly promised them. Your movement, which has mistaken the era, the people and the target, is the negation of reason and democracy, of common sense and of Islamic, humanist and universal values. This is the reason why it can never be the bearer of peace, progress, prosperity, culture, civilization or of understanding and cooperation between peoples. Your movement is doomed to failure. Karima Bennoune authored the introduction, and translated and edited from her father's original letter. The full text in French is in two parts. Part one: https://www.mahfoudbennoune.com/assets/files/Haddam-Article_%2091695.pdf. Part two: https://www.mahfoudbennoune.com/assets/files/Haddam-Article_%2091795.pdf. The full text in English can be found on the memorial website.